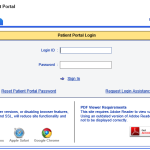 Patients can log in to the portal to receive reminders, statements, patient education materials, and lab results electronically. You may access the patient portal 24 hours a day, 7 days a week from your computer or smartphone. Patients can receive reminders, statements, patient education materials, and lab results electronically. The following are a few of the advantages of our Patient Portal.